Black Round Neck Top with Jersey Lining is rated 4.5 out of 5 by 4. Look great this season in this easy-to-wear round-neck top with jersey lining. 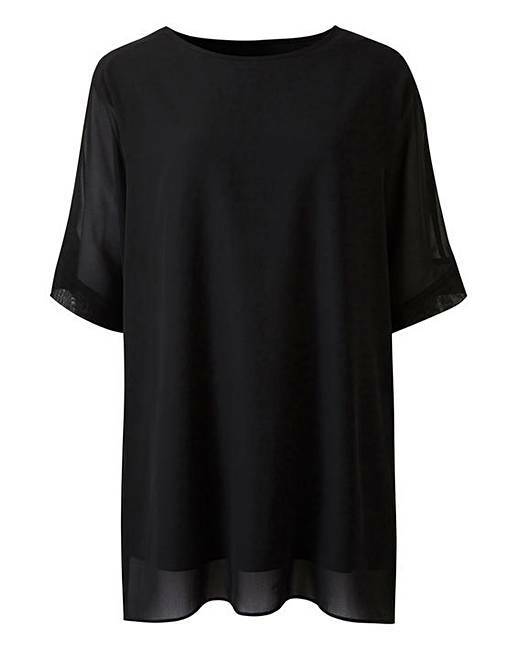 The round- neck top features a soft woven fabric over the top and a jersey lining underneath. Available in two plains and one print. This blouse looks great paired with jeans and flats for the perfect daytime look. Rated 5 out of 5 by Gillie19 from Really lovely comfortable top Gorgeous top. Great length and shape. So easy to wear. Rated 5 out of 5 by LizA from Love this! Looks great day or night. Really happy with this top and fits great. Rated 3 out of 5 by housewife from Nice top but big fitting. I bought this top in my size. It was very nice and I loved the material but it was far too big for me. I was not able to get a smaller size.